Shopify is an eCommerce platform that was created by a company based off of the original platform it created to sell its own products. Once the company realize that the shop was successful, its founders decided to start marketing the platform itself to customers around the world. It is one of the most well-known shopping-cart platforms out there right now and has a lot of outstanding features. Shopify’s features start with store design including more than 100 eCommerce templates. You can customize these themes with logos, colors, and fonts of your choice and may change the HTML and CSS code if you have the knowledge to do so. Some of the templates are free while others are premium and require that you pay extra. Once you’ve created your shop, you can begin populating it. The software will automatically resize and optimize your images for display. You can import inventory details in bulk using Excel and other software platforms. While you may upload as many product photos as you like, we were unable to find any features that pointed toward being able to cross-sell or up-sell products, which is a bit of a drawback since that is a powerful capability to be lacking. While there is no uptime guarantee for your shopping cart, there is fraud protection and all other security features appear to be great. 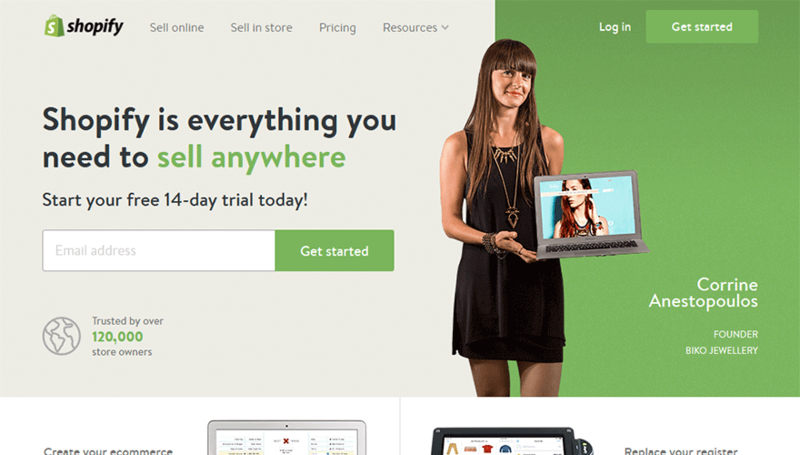 Shopify is one of the most popular eCommerce software services in the industry trusted by over 25,000 stores. They have the potential to be a top five leader if they included features with their basic packages instead of charging extra. We’d like to see an uptime guarantee. Under marketing tools we found search engine optimization as well as Google analytics integration. The analytic information helps you to streamline your marketing campaigns based on the conversions you are getting. A discount coupon code engine is included in the Professional, Business and Unlimited plans. That means if you’re part of the lowest pricing tier, you won’t have the capability to create discount codes and coupons to assist you with marketing. Being able to provide incentives is really important, so this is a disadvantage if you don’t have a lot of money to put into your store. You receive free AdWords and FB advertising credits when you purchase a package, which is a common marketing feature in many platforms. Email marketing is also built into Shopify. Considering this was the full extent of the features we saw listed, however, this area seems a little bit lacking. Paying extra for coupon codes isn’t usually a requirement with eCommerce software. Shopify is free for your first 30 days. At the end of the trial, you need to select a membership package in order to retain use of the software. The Basic level is available for $29 per month and includes free setup, unlimited bandwidth, 100 SKUs, and 1 GB storage. There is a two percent transaction fee, and as mentioned, certain features are not included in this package; so this is perhaps a bit expensive if you’re looking for something in the lower price bracket. The next tier is the Professional package at $59 per month. This gives you 2,500 SKUs, 5 GB storage, unlimited bandwidth and drops the transaction fee to one percent. You also receive important features like the discount coupon code engine. The next tier is the Business level available for $99 per month. This comes with unlimited bandwidth, a one percent transaction fee, 10,000 SKUs, and 10GB storage. You also receive real-time carrier shipping. The Unlimited Package is available for $179 per month and includes no transaction fee, unlimited bandwidth, unlimited SKUs, and unlimited storage. This package is true to its name and really is one of the most unlimited options we have seen. If you’re operating a large business, this could be a fantastic option for you at a fixed price. If however you’re a very small business, we highly recommend you start with the free 30-day trial to make sure that Shopify is going to fulfill all your needs before you decide on a package. We’ve seen better values for smaller stores with other platforms. Customer support is available via telephone or email, but not 24/7. There is no live chat feature, which is a bit inconvenient, and we’re not sure if the support is all provided by in-house representatives. A user manual, FAQ, and knowledge base are included, but we found no video tutorials. A forum is available for conversing with other users, and a company blog provides updates on Shopify. Shopify is a strong platform in terms of ease of use, product display, and store management, and security is another solid area. The customer service is lacking in a couple of areas, however, and the value of the pricing depends largely on how large or small your company is; Shopify seems best for large businesses. Marketing features also took a knock in our ratings, especially for smaller businesses that do not receive the coupon code engine with the Basic package. TopFiveAdvisor gives Shopify an 8/10.